Hosa YRA-154 Stereo 3.5mm Mini Phone Male to 2 RCA Female Y-Cable - 6"
Product #5579 | SKU YRA-154 | 0.0 (no ratings yet) Thanks for your rating! 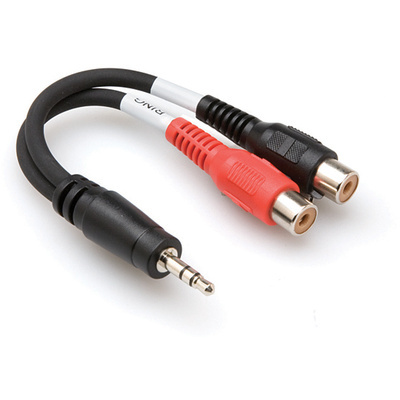 The Hosa YRA154 Stereo Breakout Cable (6''). This cable is designed to split a stereo signal. Black- and red-coded phono jacks indicate left and right respectively. It may be used to adapt a stereo cable with phono plugs to a mini stereo phone jack. This Breakout Cable can be used to adapt your portable audio device's mini-phone jack (e.g. Walk/Diskman, MP3 player, etc.) to play back - in stereo - on your home theater system. Can also be used to combine from two "left and right" RCA signals into one single stereo 3.5mm male connector.